The RASC Observatory at the TELUS World of Science offers FREE public observing throughout the year. 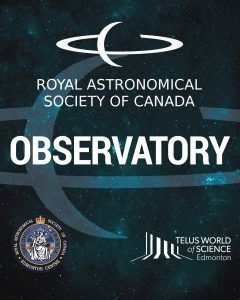 The RASC Observatory is operated by volunteers from the RASC Edmonton Centre, augmented by TWOSE staff and volunteers, who share their knowledge and love of astronomy with the public. Objects that are regularly viewed when visible include the Sun, the Moon, planets, double stars, colorful stars, star clusters, galaxies, and nebulas. Special events, when visible from Edmonton, include: solar and lunar eclipses, comets, occultations of stars by the Moon, shadow transits of Jupiter’s moons across the face of the planet, passes of the International Space Station, and Iridium satellite flares. The RASC Observatory is located on the TWOSE south lawn at 11211 – 142 Street, Edmonton. *Closed from mid-December to mid-January for the holidays. Temperatures must be above -10 degrees Celsius (including wind chill). Skies must be clear and not cloudy. To accommodate special astronomical events. To confirm that the observatory is open, call 780-452-9100 ext 2249. Dress for the weather and temperature, as the Observatory is an outdoor facility. There is low red-lighting only, which preserves dark adaptation for observers.